Flexitank have added their spill control products to their online store and add to their spill control and containment range. The new products make spill prevention and containment easier for any sized spill and are easily purchased online. Flexitank has recently extended its range of emergency storage flexible pillow tanks to include a variety of spill control products. The Flexitank spill products were recently used in the BP oil spill cleanup in the Gulf of Mexico. The Flexitank flexible pillow tanks have been manufactured for the spill control industry for over 25 years, providing a safe and secure way to hold liquids. The new products include collapsible bunds, spill mats and berm liners to allow spills to be cleaned up and contained before they become a major issue. The new range is designed and manufactured using the latest technology and the highest-grade fabrics from the USA and Europe. 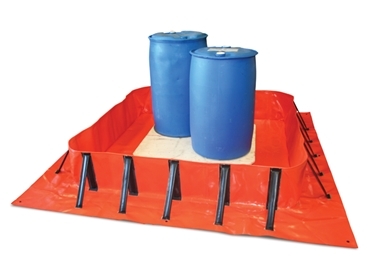 The collapsible bunds can hold 500 to 1100 litres and fold down to approximately 1/10 of their original size, making them easy to carry and transport. Each bund is made to order using bright orange, heavy duty PVC (900 gsm) so they are highly visible. The instructions are well placed outside the bag in a specially designed transparent pocket and the internal batons are already fitted so the bunds simply stand vertically against the wall when they are ready to be used. The spill mats range can hold 27 to 243 litres and are also made from 900 gsm PVC. Leak tight joints are created from a high temperature and resistance welding process and the mat walls are made from an encapsulated, compressible, closed cell foam which is 75mm high; making them lightweight and very long lasting. Both products have an optional XR3 geo membrane and high quality polyurethane materials for greater resistance to punctures, tears, abrasions, UV radiation, temperature extremes and chemical attack.